Hokkaido is not only Japan’s second largest island but also the northernmost prefecture, boasting dramatic mountains and natural hot springs. It’s also one of the country’s finest skiing destinations. However, thanks to its diverse scenery, it’s stunning all-year-round. In summer, you can cycle through the foothills and admire the colourful flora, and during winter, you can take advantage of the excellent ski resorts. The island is also blessed with gorgeous hot springs known as ‘onsen’. One of which is frequently visited by macaque monkeys who soak in the warm mineral water and jump in from high wires, making a truly remarkable sight. Hokkaido’s natural splendour doesn’t stop there; Lake Mashu is widely regarded as the most beautiful in Japan and once held the world record for highest water clarity. It has an island in the middle, known by locals as the ‘Isle of the Gods’, as well as three viewpoints all offering sublime views. 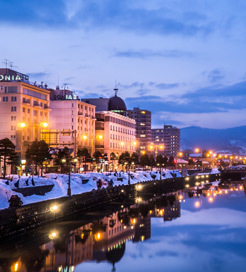 The island’s capital, Sapporo is the fifth largest city in Japan and offers a cosmopolitan retreat from the peaceful wilderness. Also, its gastronomy is renowned across the nation and is known as the birthplace of the popular noodle soup, miso ramen. Before you set off exploring Hokkaido, be sure to soak up the capital’s vibrant nightlife or to visit the fascinating brewery which houses impressive production plants, so there’s no shortage of fun activities on this Japanese island. There is a ferry crossing to Tomakomai on Hokkaido’s southern coast from Oarai, situated just over a hundred kilometres northeast of Tokyo. The journey lasts around half a day with frequent sailings provided every week. For more information, please visit our Ferries from Japan to Hokkaido page.